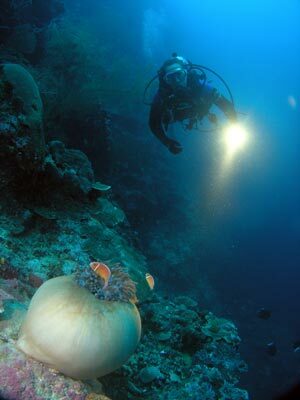 The northern end of New Britain Provence in Papua New Guinea (the Rabaul area) has some of the best dive sites in the World. There are so many good sites, it would take years to explore them all. One of the better sites is Pygmy Point. 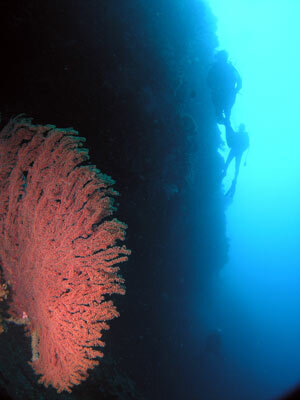 This is located on the western side of Reimera Reef. This is more commonly known as Horseshoe Reef for the obvious reason that it is shaped like a horseshoe. This reef is west of Urara Island which is off Cape Liguan. It is 14.3 kilometres from Kabaira Resort and it takes just over 40 minutes to get there in their "slow" boat (does about 23 km/h). 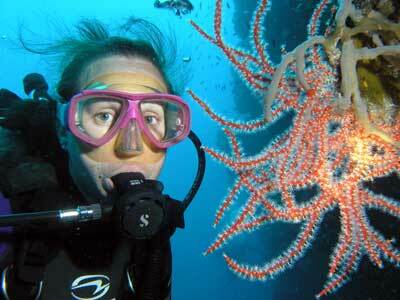 Reimera Reef has a radius of about 350 metres. If you imagine the reef to be a C and the top of this screen north, then the reef sits like this: C. This dive starts at the middle of the C on the left side at GPS S4º 9' 54.0" E151º 54' 52.9" using WGS84 as a datum. The reef top is less than five metres here and the wall drops off very quickly to well over 40 metres. After entering the water, drop down the wall to about 22 metres. There is a small overhang that has a large gorgonia. 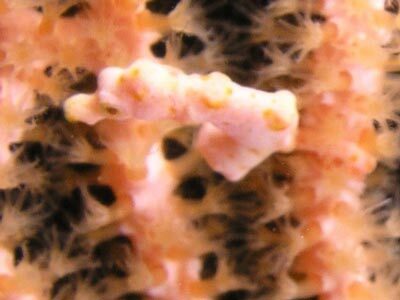 On this gorgonia there lives at least one, and sometimes more, pygmy sea horses. The one that we saw was so small, only six or seven millimetres long. 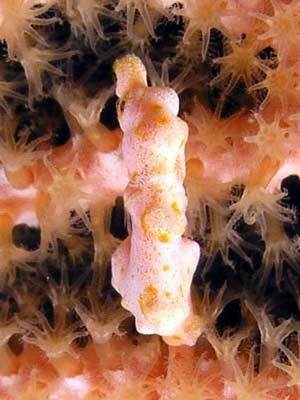 If it had not been pointed out to me by the dive operator, I would have never even imagined that it was a pygmy sea horse. I managed to get a couple of photographs of it but they were from head on and as such, do not really show it to its best extent. After this, we drifted with the current that was running to the north. The current was not too strong, you could easily swim against it, and it made it a very relaxing dive. The wall has a few more overhangs and lots of indents and some minor cracks. 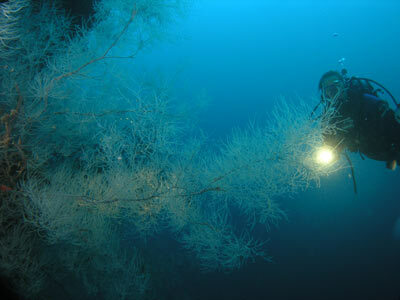 There are numerous gorgonias, barrel sponges and some small soft corals. It is a very colourful wall. You do not need to go to the bottom, I only went to 35 metres and there is no real need to go deeper. Once you reach your deepest point, you start a gradual ascent, keeping out of decompression. All along the reef there are lots of anemones with clownfish and most of them also have clear shrimp in them. 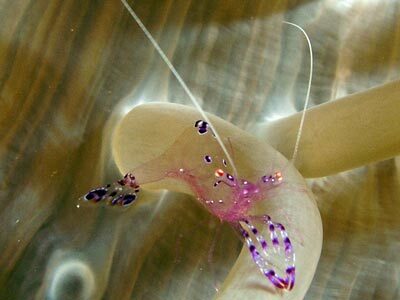 There are also many different nudibranchs. There were some larger fish to be seen, including a few reef sharks, trevally, giant trevally, barracuda and even a turtle. 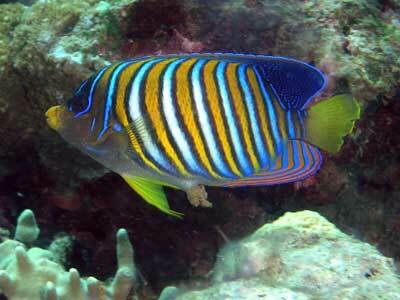 There were all the normal tropical fish. The reef turns to the north-east and finally east. We finally surfaced after a dive of over one hour. We had travelled 350 metres in a straight line, perhaps 400 metres all up. Visibility was 25 to 30 metres and the water a great 29ºC. Sea conditions were mirror-like. A great dive.